3'-Desthiobiotin-GTP or 3'-Biotin GTP are guanosine triphosphate (GTP) analogs which are modified at their 3’ position with desthiobiotin or biotin, respectively. When used with the Vaccinia Capping System, (NEB #M2080) these reagents enable affinity tagging of RNA triphosphate ends. 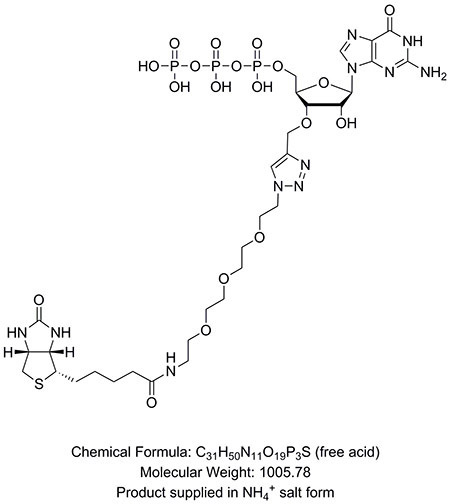 Tagged RNAs are enriched by binding to Hydrophilic Streptavidin Magnetic Beads (NEB #S1421). Desthiobiotin-tagged RNAs can be eluted with free biotin. This approach is used in Cappable-seq, a method developed at NEB for directly enriching the 5’-ends of primary transcripts (1). Boutard, M. et al. (2016). Nature Communications. Ettwiller, L. et al. (2016). BMC Genomics.